La Maïoun Guesthouse has been built in an ancient temple (built in 1855). It keeps his authenticity, with modern comfort. You’ll enjoy the cosy and friendly atmosphere of the place. In the common area you can find a relaxing and reading area, tea and coffee for free, cards and board games, and access to the balcony with view on the garden. La Maïoun Guesthouse is well-located in the city. Only 500m from the beach and the famous promenade des Anglais. 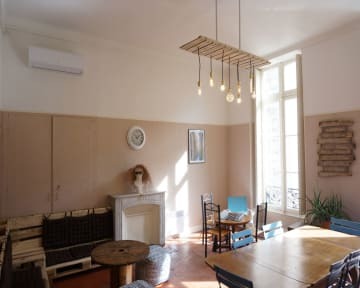 La Maïoun Guesthouse is close to the old town and place Massena (200m) as well. There are many bars, restaurants and museum around. Just in front of the bus stop and close to the tramway, it’s really easy to come here. You can come by bus from the airport (30 minutes), or by tram from the train station (10 minutes). La Maïoun Guesthouse offers 2 comfortable dorms and one double room. One female dorm of 6 beds, with own bathroom and toilet. And one mixed dorm of 6 beds, with relaxing area, private bathroom and toilet. This one has a view on the garden. After hundreds of nights in hostels around the world, we designed custom bunkbeds that suits all the needs of the modern day traveler, with curtains for your privacy, your own reading light electrical outlet and locker. The double room has a view of the garden, a private bathroom (outside the room) and shared toilets. Indicate your arrival time because staff is not on site all the time. Taxes of €0.75 PPPN included. Beautiful guesthouse in a great location, with very kind owners! So glad I found this place! Best hostel in Nice from what I have seen and heard around. I hope to go back it was the best way to end my backpacking trip. Had a wonderful stay at La Maioun Guesthouse. It was my first time lodging at a hostel and it was a great experience. The staff were warm and welcoming and accompanied an early check in (10am). Breakfast was filling as there was a large variety each morning. 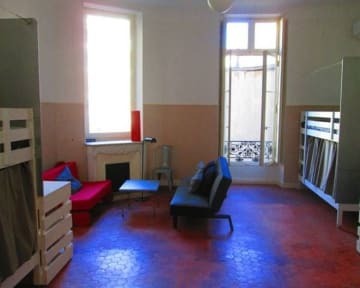 Apparently some hostels have a party-vibe, however, La Maioun was more quiet and calm which was personally preferable. Highly recommend for first-time hostel goers or someone looking for something a little more quiet. Thanks! Really great place. Bunks in the dorms had everything you could want: curtains for privacy, sockets and a reading lamp. Lockers are large . Location is excellent very near to the beach and Old Nice. I would highly recommend La Maïoun. The rooms are big and spacious with ample locker and shelf space for each person and curtains around the beds for privacy. There are not a lot of beds which gives the guest house a more cozy, personal feel. The free breakfast was delicious and often included homemade baked goods. The location is great, very central but quiet. The was a good hostel. Everything was clean and well kept. It felt very comfortable and quiet. I just feel I paid way too much for my stay here and didn’t get a good value for my money. There is no kitchen to use! So if you’re a budget traveler I definitely would not recommend staying here. There no atmosphere here either.